This was an actual wearable popcorn box complete with a space on top for fresh popcorn. 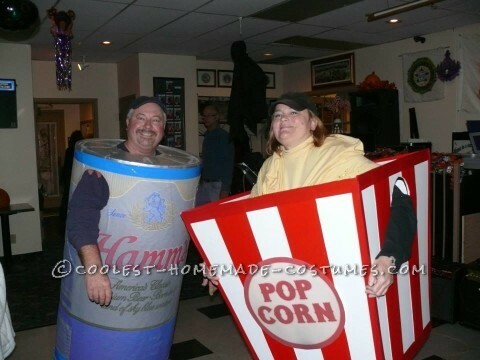 People loved it, eating popcorn from it as they danced the night away. It was made by taking legths of 1″ wood slats, forming a top frame square and a slightly smaller bottom frame, to give the box a tapered look. The four sticks of wood are held together with small angle brackets and small wood screws. Take your two wood square fromes and staple four sides onto them made from white foam core. Cut red vertical stripes from poster board, glue them on to the foam core. Use red duct tape on the vertical corners or edges, to make it look nice. Make “popcorn” label on your computer, have it printing out big and glue that on the sides. Cut arm holes in the appropriate place, select carefully. a cut is a one time thing! Then find a yellow oversized turtleneck shirt and staple it to the top wood frame all around, not to tight, you’ll want it to sag inward a bit to hold real popcorn, the finishing touch. Wear tights and heels to add to the “cartooney” look. This costume is easy to make. Get a cardboard bulk food container from a school or bakery, cut 9inch holes in the sides about 2″ down from the inverted bottom. These laterally opposed holes will be for your arms. Cut a 10 to 12″ hole in the top, (the old bottom) for the head hole. Glue gun some foam rubber blocks inside the top large enough to pad the container against your shoulders for all-night wearability… important! Then take heavy duty scissors and cut the top and bottom off a real beer can, cut the can up the side as well so it can be carefully unrolled and laid flat. Take the flat can to the office supply story and have them photocopy it on their large format printer to the dimensions you supply from you barrel’s circumference and height. Carefully apply the print to the bin after spraying the bin with re-positionable, preferably, glue. And that’s pretty much it. Practice putting in on and off before going out, very important. The best way is to lay the can on a bed band go into it with your hands above your head, stand up slowly as you work your arms thru the arm holes.